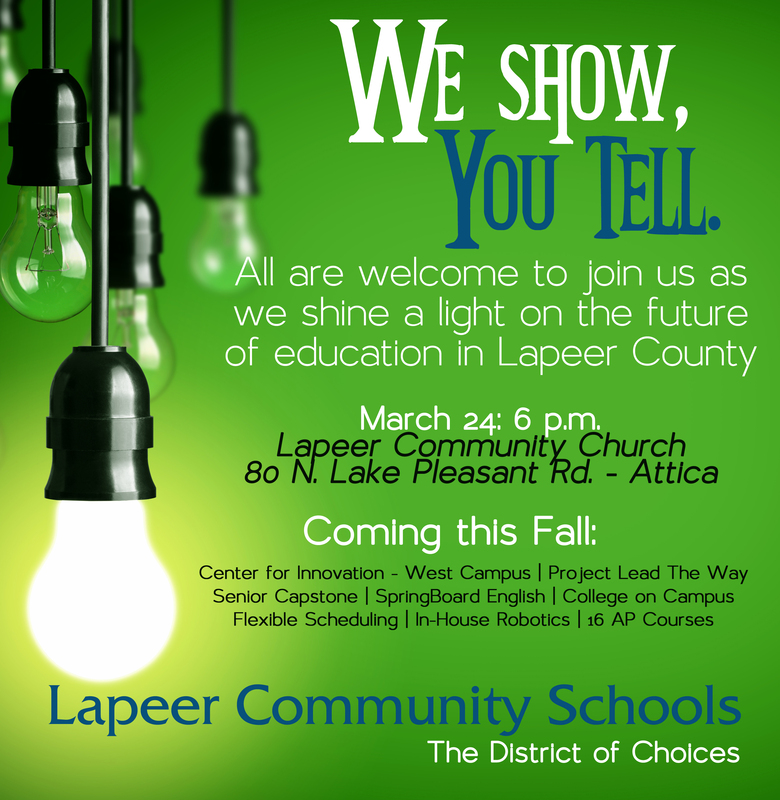 You are cordially invited to attend the District’s next Innovation Night at 6 p.m. on Monday, March 24, at Lapeer Community Church. The church is located at 80 N. Lake Pleasant Rd. in Attica. This will be a great opportunity for you to learn all about the new and exciting opportunities coming to Lapeer Community Schools this fall. Innovation Nights are tailored to parents and students at the secondary level, but younger parents are welcome to come and learn about future academic offerings for their children. It’s never too early to think about your child’s future! On the agenda will be Project Lead The Way, a Science, Technology, Engineering and Math (STEM) program that begins at sixth grade. In addition, school officials will discuss the Center for Innovation (at the current West High School campus) and the multitude of programs that will be housed at the facility including, STEM programs, robotics, College on Campus, Springboard, AP Capstone, outdoor athletics and more. For more information, or if you are interested in enrolling in Lapeer Community Schools, contact Susan Wilmers at swilmers@lapeerschools.org.